I am so excited to be participating in this year’s Freaky Friday Blog Hop: Fall Edition! This group is the brainchild of my friend, Michaela’s and it is SO MUCH FUN! For those of you that aren’t familiar with Freaky Friday, it is a group of food bloggers that get assigned a secret blog and we get to choose any recipe we want to make from it for our own blogs. Then all of the recipes are revealed at the exact same time and we get to see who had our page and which recipe they selected! It has been a great way for me and my readers to find new blogs to follow, and I feel honored to be a part of it! So one more thing about Angela you may not know, (We are facebook friends so I have some insider info 😉 ), She is an AMAZING decorator. Her and her family recently purchased a GORGEOUS home and I have SOME SERIOUS ENVY going on of her abilities to completely makeover old furniture into the most gorgeous pieces. Her home is one of the most beautiful I have ever seen! It is truly a work of art. Because of her Italian roots, Angela has some AMAZING pasta recipes in her site, along with lots of delicious baked goods, some healthy options, vegetarian meals, appetizers and honestly just about anything you could ever want to make!!!! I probably spent more time looking over the recipes on her blog than I have in any other blog I have been assigned, just because there are SO many different types of meals I want to try! I pretty much had decided to go with an Italian recipe from the beginning. A few that caught my eye were her Classic Spaghetti & Meatballs, Tagliatelle with Roasted Tomatoes & Pesto Ricotta and her Spinach and Artichoke Stuffed Shells. Then I saw her Easy Black Bean Soup and it looked SO DELICIOUS. My husband ALWAYS orders Black Bean Soup anytime we go to a Mexican restaurant. I knew he would LOVE IT!!! It turned out even better than any we have had and was PERFECT to serve along with Grilled Chicken Quesadillas for dipping after we got home late on a weeknight from football practice. My kiddos INHALED this soup. Football practice makes my youngest so hungry. He walked in the door and was like, ”OH MY GOSH THAT SMELLS AMAZING!” It really does too. I can not wait for you to try this delicious soup!!!! In a large pot over medium heat add in the bacon grease, red onion and bell pepper. Cook until softened. Add in the garlic, the last minute or 2 and stir constantly to keep it from burning. Add the chicken broth, black beans, salt, pepper, cumin and chili powder. Bring up to a boil then lower and simmer for about 20-30 minutes. Using a hand blender, blend the soup until smooth. Simmer for another 15 minutes or so, or until the desired thickness is reached. Serve with toppings of your choice! ENJOY!!! Check out the rest of the Freaky Friday Recipes from our blogger friends! Brandi Burgess A.K.A. 'Aunt Bee' has been married to the love of her life for 10 years. A Birmingham native, She and her husband helped run her parents successful business for 8 years before finally spreading their wings and setting out to make it on their own. They moved to Huntsville in 2012 where she is a stay at home mom, to their 2 kids ages 10 and 5. She has a passion for cooking for her family and trying new recipes. Any soup that kids inhale needs to be made immediately! This looks delicious – soup is definitely my meal and I can’t wait to give this recipe a try! My whole family loves black bean soup and I make it fairly frequently. I love trying new versions though, and this looks delicious! I’ve never tried a black bean soup I didn’t like and I KNOW I will like this one. Black bean soup is one of my favorites! I’ve been wanting to try making it! I just love soups! This is perfect for Fall! Who needs to eat out when you can make soup that looks this delicious at home? WOW! My uncle from Cuba always made the black bean soup for Thanksgiving and his has always been the best I have had his. His takes forever so I am excited about this easier version! 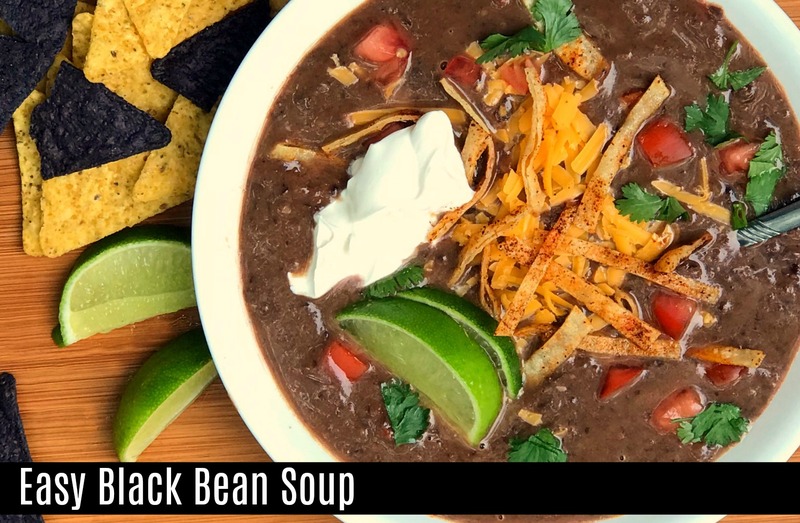 I love black bean soup and this one sounds so delicious! I also love how easy it is! I’m loving everything about this soup; the color, the texture, its easy and especially the flavor profile that you’ve created; fantastic job here! 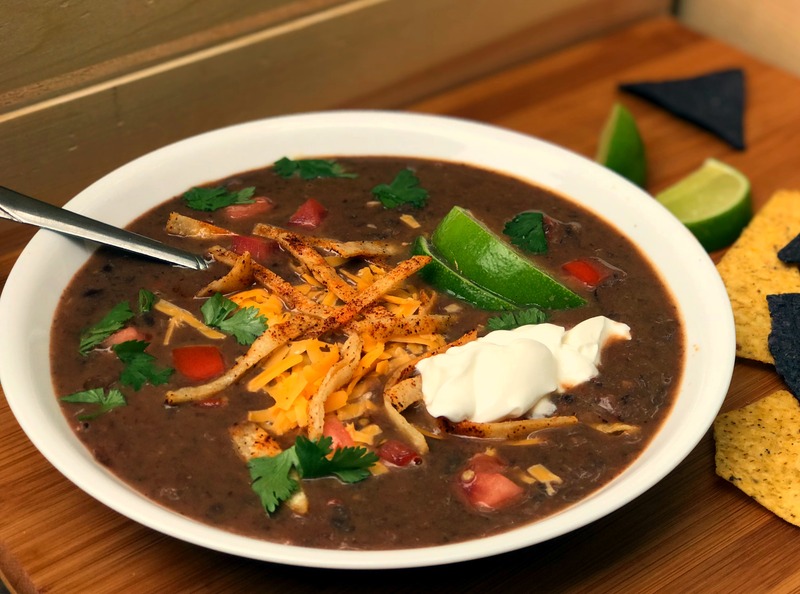 I love black bean soup, and this one looks so yummy. Perfect for the chilly weather that we’ve been having. What a lovely post and I LOL about the exercise comment!!! This is one meal my whole family will love. Love all the extra toppings too! I was just having a serious craving for black bean soup and was wondering about a quick put together skipping the dried bean soak. This one is perfect and I can’t wait to try it! Brian absolutely loves black bean soup. I know this one is happening at our house!! © [2012-2019] · Aunt Bee's Recipes.